Sri City, April 24, 2018:- Sri City won yet another international award. It bagged the prestigious ‘Golden Globe Tigers Award for Excellence’, under the category ‘Integrated Township Project of the Year–India’. Mr. Ramesh Subramaniam, President, Sri City Foundation, received the trophy and a citation from the organisers in a glittering awards ceremony, held at Pullman Kuala Lumpur City Centre Hotel, Kuala Lumpur on Monday evening. “Such accolades are a reminder of the efforts and innovation we inculcate in our project to set it a class apart. We thank the jury and the organisers for conferring us with the esteemed award,” he added. The jury was unanimous to confer the award to sri city in recognition of its dedication to excellence and leadership in the country. 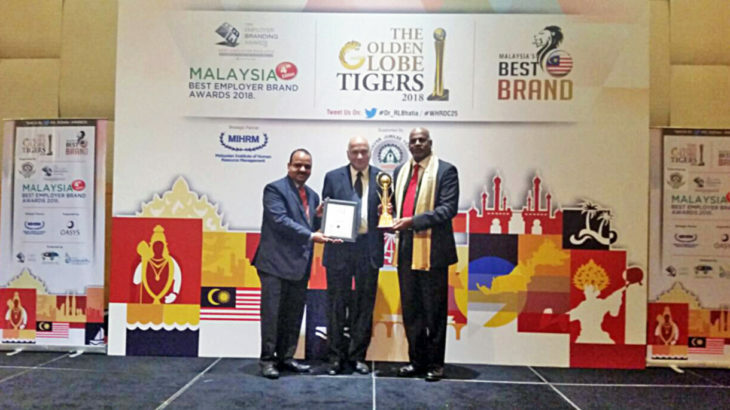 The Malaysia based USG Boral, the world’s leading manufacturer and supplier of a wide range of innovative products and systems for commercial and residential ceiling and wall applications, which has its unit at Sri City, bagged the award, among others. The Golden Globe Tigers Awards, established by World CSR Institute, is an independent and not-for-profit organisation, is supported and endorsed by World CSR and World Sustainability. it is an international platform to recognise organisations and industry leaders across Asia for their commitment to excellence in the realms of marketing, quality, branding, CSR and social innovation, education and academics.